We are starting on the tear back to uncover layers of the past. We are asking the walls to talk and listening carefully to what they tell us. We will be having an open house in March of 2015. email info@fscpp.ca for information. 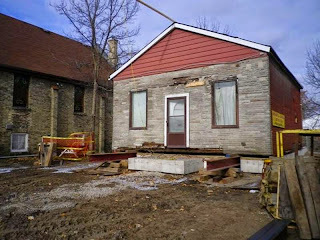 After sitting at 275 Thames Street for 166 years, the Fugitive Slave Chapel has been moved to 432 Grey Street and, for the first time has had a chance to meet her 145 year old daughter, Beth Emanuel Church which is sitting next door. The move took place on November 12, 2014. Let us know what you are thinking. Post a comment here. We would love to hear from you. Why is the old "fugitive slave chapel" of London, Ontario worth saving? Although some see this as a site for Black Heritage, it is a site rich in North American History. When fugitive slaves settled in London, Ontario, they were looking for freedom and safety. The damp, smelly hollow had very low land prices, and the escaped slaves had very little, so they worked and saved to buy this inexpensive land. In 1847, along with other Blacks, they acquired the lot at 275 Thames Street and erected a modest house of worship a year later. This was the first African Methodist Episcopal Church built in London, and locals sometimes called it the "fugitive slave chapel". In 1853 the railroad arrived in London, and it caused a construction boom and land speculation that would last until the depression of 1857. During this period, the values of the modest dwellings of the fugitive slaves increased and some of them became very well-to-do. In Illustrated London, a book from 1897, Archie Bremner wrote that in 1853 the Black population "owned real estate assessed at $13,504 -- a considerably higher average than for White men of the period." The Black population began to spread out, and they built a more impressive church building about 1868-1869 on Grey Street, in what is now known as the SoHo district. In the British Commonwealth anti-slavery laws dated back to July 9, 1793, and Slavery was abolished in 1833. In the United States, slavery would not be abolished until the end of the Civil War in 1865. In 1858 and man named John Brown came to Canada from the United States and visited the chapel in London, Ontario. His goal was to free slaves and get weapons for them. The federal armory in Harpers Ferry, West Virginia was a good place to start, but he needed money. The relatively wealthy Black population in London seemed like a good source of funds, so in 1858 he entered the premises at 275 Thames St in London to make his appeal. His fundraising was a success. The raid on the arsenal at Harpers Ferry was not, however. With many of his men killed, John Brown was arrested, and after a speedy trial, was hanged on December 2, 1859. Many regard this skirmish as the battle that started the Civil War. In 1861, the United States' Civil War began when 7 southern states seceded from the Union (4 additional states seceded later) over disagreements about the expansion of slavery into the western territories, states' rights, and trade and tariffs. They feared that the election of Abraham Lincoln in 1860 on a platform that suggested an opposition to slavery in the territories would eventually lead to the abolition of slavery, which would have destroyed the South's economy and culture. The war ended in 1865, and slavery was abolished in the United States when the Thirteenth Amendment was adopted on December 18, 1865. So why is the building at 275 Thames Street important to our heritage? It was instrumental in the fight against slavery and the Civil War. It is part of the history of this continent, and that it why it is worth saving.